This cake turned out even better than I could have imagined. I made two wee cakes in case one of them turned out wrong, but really the greatest danger was me eating both cakes before I could photograph them. 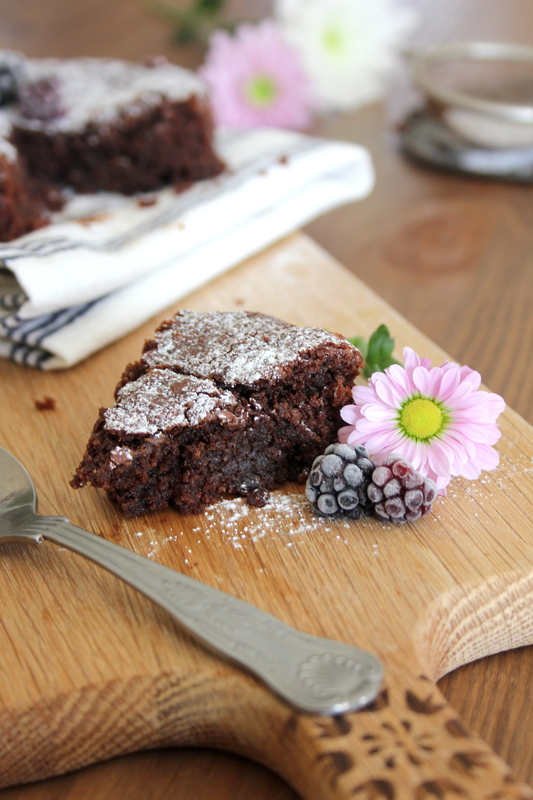 They are that good: dark, fudgey, divinely sweet – and totally gluten-free and vegan. Score! 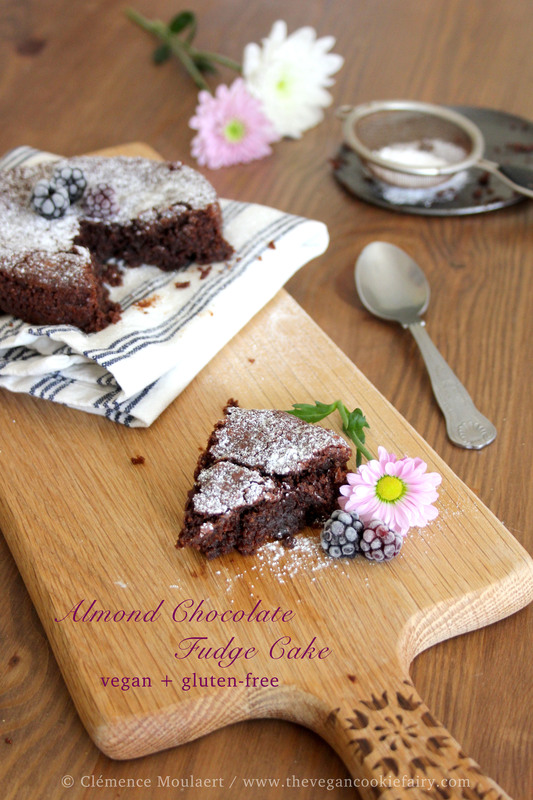 Amandine is a Romanian type of chocolate cake usually filled with almond cream. The recipe I was adapting did not call for almond cream but instead used almond flour (almond meal), which, combined with the melted chocolate and (vegan) butter makes this whole cake gooey and fudgey. Basically the best thing to eat. Ever. The cakes rise quite a bit the first fifteen minutes or so in the oven, then they start to fall. Don’t be alarmed by this – that’s how they are supposed to be! There’s something so nice and homely about a fallen cake: the crackled top, the fudgey centre, the not-quite-so-perfect look about it. Nobody cares that it doesn’t look like the winning cake on the Great British Bake Off because that’s not the point of it in the first place. I assume it’s possible to make one medium-sized cake from this recipe (roughly 20 cm/7-8 inch) but, being on a tight Vegan MoFo schedule, I haven’t tried this myself. If you do, let me know how it turns out! 1. Pre-heat the oven to 180ºC (350ºF). Grease 2 15cm (6 inch) round springform tins. 2. In a heatproof bowl suspended over a pan of simmering water, melt the chopped chocolate and butter. While you are doing this (and keeping an eye on it) combine the ground almonds, cornflour, baking powder and raw cane sugar in a large bowl. Also mix the water and ground flaxseed in a small cup and set aside to gel. 3. Once the chocolate is melted, pour into the bowl of dry ingredients. Also add in the oat milk, almond extract (if using), flax “egg” and nut butter, and fold in the wet ingredients. 4. Divide the batter between the two cake tins. Bake for about 25 minutes, or until the sides come away from the inside of the tins and the middle of the cakes have risen and fallen a little. 5. Cool on a wire rack before removing the cakes from their tins. Dust with icing sugar if desired. OMG, la décadence, another of your sins, it’s breakfast time here in Whistler, so yummy, I am hungry now, gone try when I am back home..
Pingback: Vegan Mofo Day 15 – Banana Beignets & Lemon Curd | Bananen-Beignets & Zitronencreme | VGNGF = vegan, glutenfree, delicious.